The new cards keep coming. Hearthstone fans will have a hard time maintaining their excitement over the next few weeks as Blizzard continues to reveal cards from the upcoming Rise of Shadows expansion. Improve Morale is a one-mana spell that allows you to deal one damage to a minion. If it survives, you’ll get to add a Lackey to your hand. Lackeys are new token cards that have what will hopefully be a helpful Battlecry. Lackeys can’t be placed into a deck and can only be created by other cards. For now, Lackeys will only be included in classes that revolve around what Blizzard is calling the E.V.I.L classes. This means Lackeys will be connected to classes that are represented by one of the expansion’s villains. This means the only classes that will have Lackeys are Priest, Rogue, Shaman, Warlock, and Warrior. 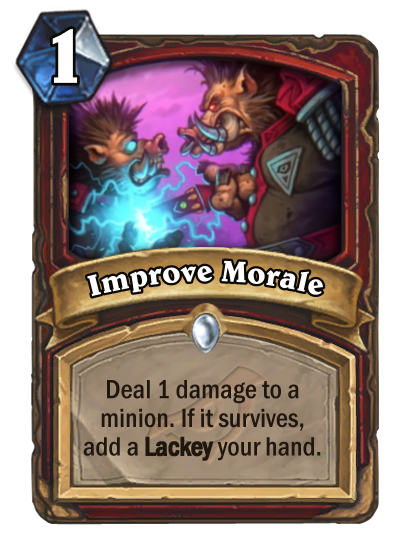 Improve Morale will be helpful to Warriors since they have tons of minions with beneficial mechanics that require damage being taken to activate. The team stressed that Lackeys are a year-long addition to the game, so we can expect to see more Lackey cards introduced beyond Rise of Shadows. Check back for more Rise of Shadows reveals and information. You can see a schedule of the upcoming card reveals here. The Rise of Shadows expansion releases on April 9.